Peter is our office junior here at intelligent-dog.com. If we were human we might call him our general dogsbody, but we are dogs and do not want to give him ideas above his station. Anyway it is Peter’s birthday today. Happy Birthday, Peter! To celebrate this we are going to write a blog post on a subject which he knows intimately and his performance helps prove our point. Boiling an egg is not rocket science or the most difficult task in the world, but it is still too difficult for most humans and probably all men. We have sat under the kitchen table listening to criticism of Peter’s efforts at boiling zillions of eggs. Sometimes these unsuccessful eggs cannot even be eaten by a human. 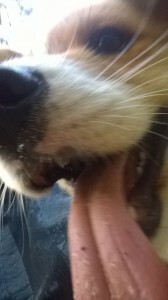 That is great, as dogs are more tolerant of errors and can always eat what a human turns their nose up at. In Mr Jeremy Paxman’s book about the British Royal Family there is a story in which he claims that Prince Charles gets seven eggs boiled for slightly different lengths of time and then chooses the best. Prince Charles claimed this was completely untrue, but who knows. 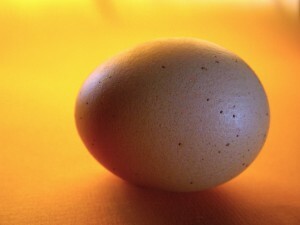 We have overheard humans say that if they had the money they would also boil the seven eggs and pick the right one. All we are saying is – Prince Charles can afford the eggs. I am not exactly sure where Nordic walkers come from. I guess it is somewhere up near the North Pole. I can understand them wanting to leave the North Pole, particularly at this time of year when it has neither daylight nor warmth. However, a lot of them seemed to have come to my forest just outside Warsaw. This I cannot understand. You would think that if someone was trying to escape from the cold dark winter they would go somewhere like Australia where they could complain about the heat or even the South Pole which in January would be like summer in the North Pole. Instead they come to my forest where it is dark at 3.30PM and for the next few months will be pretty cold. Nordic walkers in the forests of Warsaw. I have not yet seen a Nordic Walker with a dog so I guess they have left the dogs back in the North Pole. I very much hope they have someone looking after them. The other thing I cannot understand about Nordic walkers is the sticks. Each of them has two sticks and they seem to make quite a bit of noise with them. However, they don’t seem to use the sticks for anything useful. They are pretty robust sticks and could easily be used for a game of fetch. Once when my pups and I met a group of Nordic people we tried to persuade them they could do this but they ignored us and went on their walk making far too much noise with their sticks. An interesting observation is that on January 1st it looked like an entire Nordic city had moved into my forest while on January 2nd it was more like a town and it became a village the following date. There are now Nordic walkers from isolated dwellings. I guess this may have something to do with how humans approach New Year’s resolutions. I know it is not a very Christmassy theme. Indeed, Sasza the cat told me I should write about this as far back as November. I even planned to do it then but every time I decided I would start writing the prospect of a walk, a treat or a snooze got in the way. What is a dog supposed to do against that sort of temptation? Anyway, here is the blog post about this major problem. 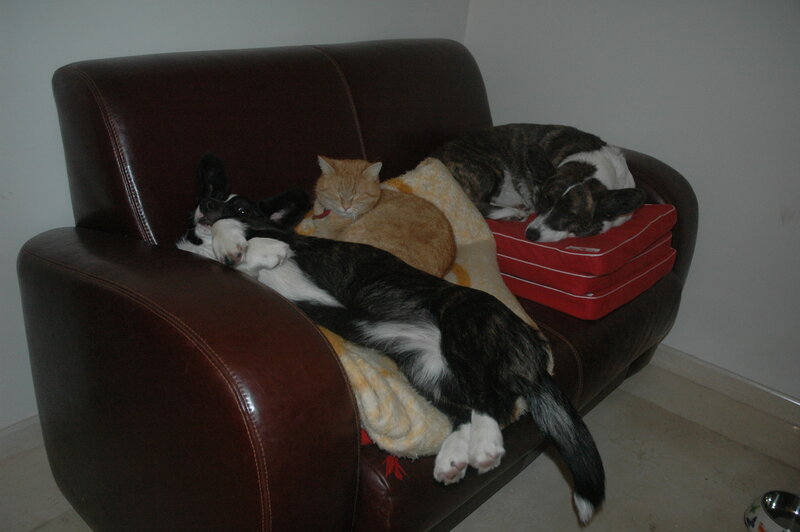 Of course Sasza the cat loves the puppies but sometimes they are a bit too puppyish if you get my meaning. She has been telling me for some time that they need one or two basic rules which will ensures peace, harmony and most importantly a scratchless cat. Rule 1 – What the cat says goes! According to Sasza if dogs and in particular puppies were sensible enough to understand this basic rule the world with be a much more peaceful and beautiful place to live in. 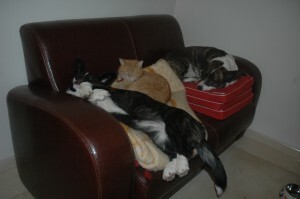 Rule 2 – Four puppies should not attack one cat at the same time! Obviously the need for rule 2 is because rule 1 has already been ignored by four very excited puppies who are rushing after the cat and doing their best to give her a little nip which in all this excitement may even be a medium or a big size nip. 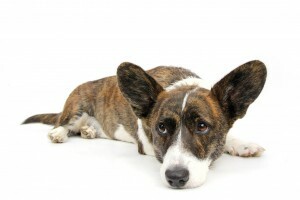 Rule 3 – Four puppies should not work in cooperation with each other when attacking the cat at the same time! Rule 3, according to Sasza gets to the very heart of the problem. If four puppies were simply chasing her then there would be an inconvenience rather than a problem. She could simply out-run or out-climb then and in a minute or two would be safe. However the puppies place two in front and two behind and with military planning worthy of Julius Caesar corner the cat. This most definitely is not allowed. 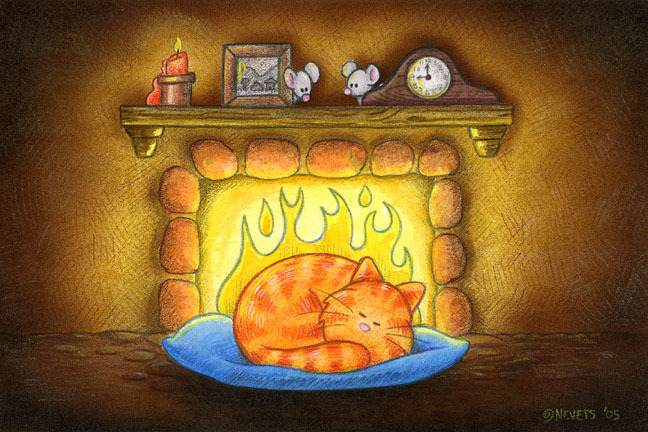 Rule 4 – The Giant Cat Heating Machine is for the cat! 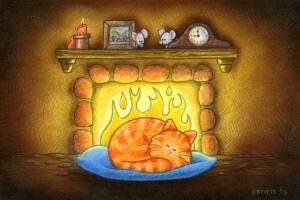 People call it a fireplace and when lit it is very pleasant to lie in front of. Sasza calls it a Giant Cat Heating Machine and agrees that is very pleasant to lie in front of it when the fire has been lit but not so pleasant when four puppies have the same idea. Rule 5 – If one of the staff is carrying the cat, puppies are not allowed to bite the cat’s tail even if it is within easy reach! Sasza says that it is self-evident sometimes the cat needs to be carried from the place where she is snoozing to where she can eat and should not be disturbed during this process. Puppies on the other hand see a tail hanging down as an opportunity. 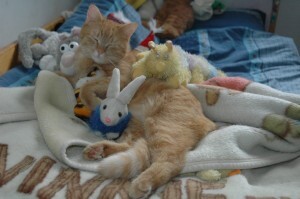 Rule 6 – The cat decides if it wants to play! Sasza does like to play sometimes and at least once or twice a year will be in the mood where she will want to have some fun with the puppies. On these times it is permitted for an individual puppy to play with her and on special occasions maybe two puppies. However, these special occasions can end at any stage and then the puppy must stop playing and go into a corner and not disturb the cat. Rule 7 – Puppies should follow rule 1! When we crossed the border between Hungary and Romania we thought it was just another EU country. The first surprise came when it turned out that they actually check your passports at this particular border (no Shengen or just over-cautious?). 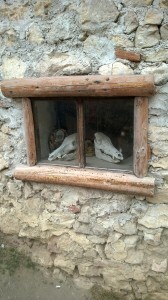 The next surprise came when we realised how remote and wild Transylvania is. 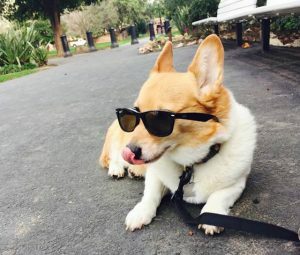 The third surprise was that there are no Corgis whatsoever in Transylvania, and perhaps even in all of Romania (I found this out from a Romanian lady who kept screaming ‘Corgi’ at the top of her lungs and grabbing me every 5 minutes at the dog show and kissing my nose enthusiastically). 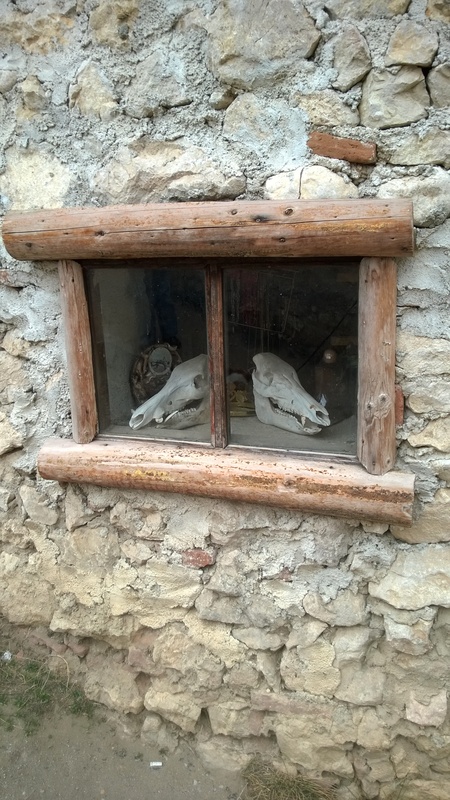 Little did we know that there are a lot of other mythical beasts that still populate the Transylvanian countryside…. So, we encountered a number of sheep, goats, donkeys, chickens, rabbits, deer, elk etc. on the roadside and even in the middle of the road at all times – which made the going rather slow at times. We had been in Transylvania for one day already and stayed in Cluj-Napoca when we decided to poke our Corgi noses into the vampire myth. It was dark by the time we arrived at Sighișoara. That is where he was born. Some people claim his real name was Vlad Țepeș, but this was a nickname he got after he had first impaled thousands of people and then “died”. His real name was Vlad III Dracula (Son of Dracul). 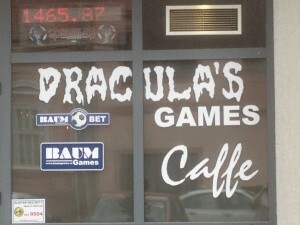 We saw signs of the Vampire’s influence everywhere we went. You won’t believe what happened as we were getting out of the car to explore. Darkness was falling over Sighișoara by then – it was cold and raining. Our people had parked the car at the foot of the Citadel where the old town is. Bonnie and I had just been taken out from the car when suddenly thousands of bats flew out of the tower and passed over our heads. Monika said it was just a flock of crows but we knew better. After all, this was Dracula’s birthplace. Dracula’s father, Vlda II Dracul, was a famous knight and a member of the order of the Dragon. When Dracula was five, his father became King of Wallachia. 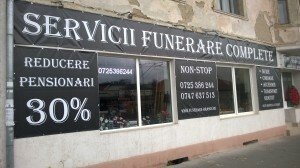 The family moved south from Transylvania and Dracula did not actually move back to Transylvania until after he “died”. Some historians say the event that shaped him, both as a man and a vampire, was the fact that he was kidnapped by the Turks at the age of 13 along with his brother Radu. Radu was a very subservient hostage and won praise from his captors for being handsome and well behaved. Vlad Dracula did not get such good references from the Turks. 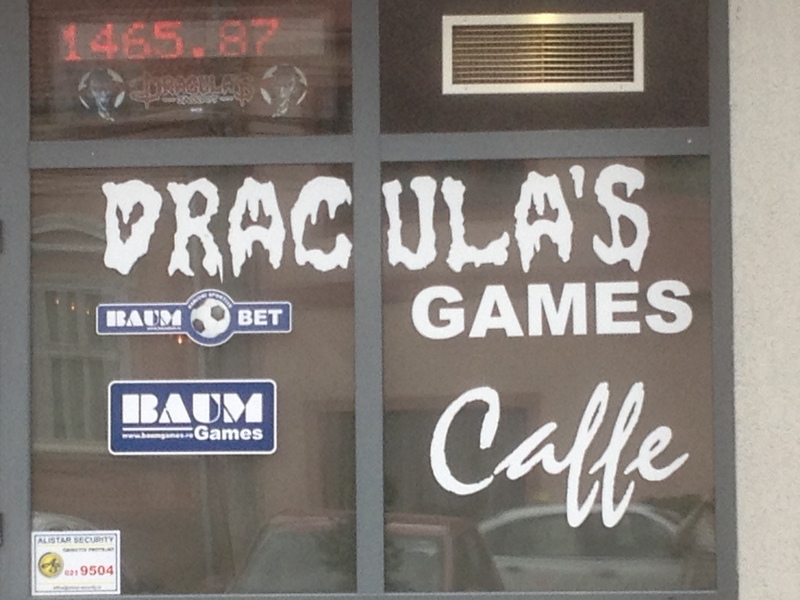 Dracula himself is very well organised. 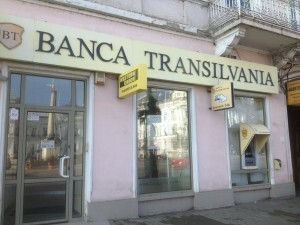 Throughout Transylvania there is a network of banks and ATMs called the Bank of Transylvania. 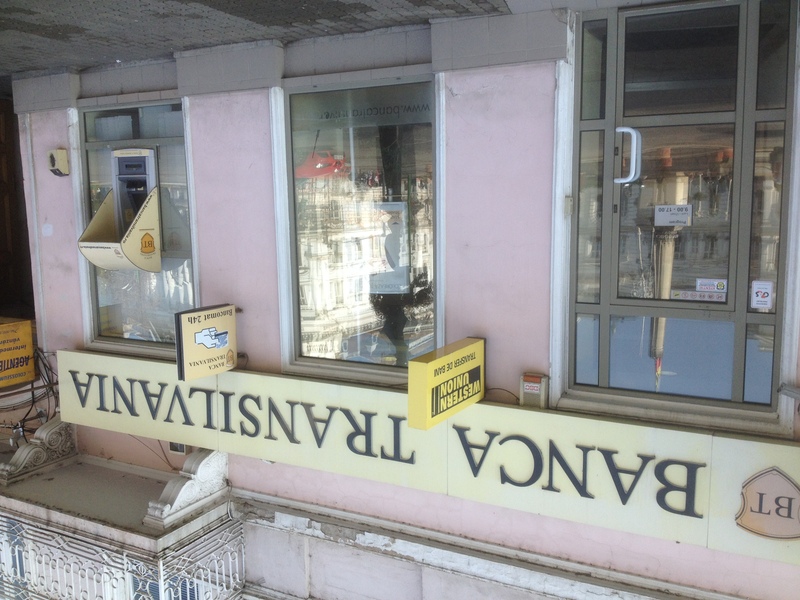 At first we thought this was a regular bank but when you go to the Automated Taker of Money you can either purchase blood for money or donate blood for money. No search for Dracula can be complete without paying a visit to Dracula’s Castle. 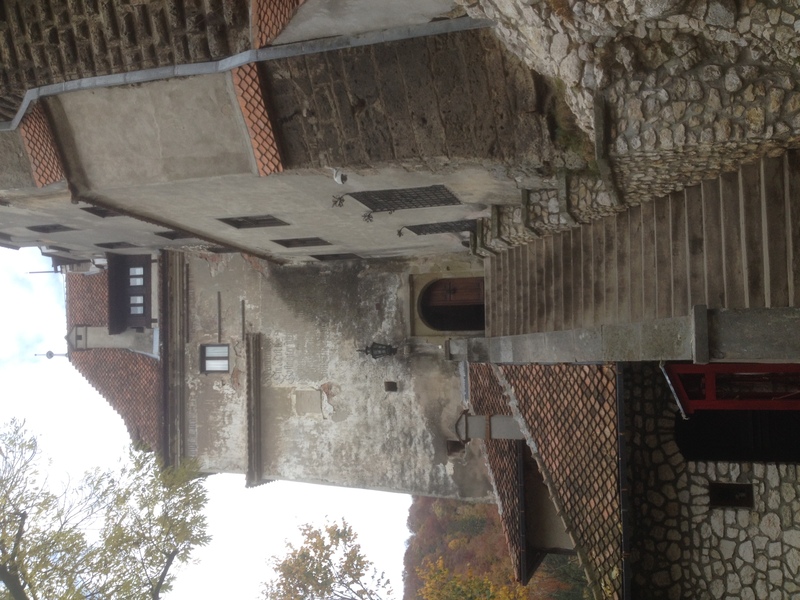 This is also known as Bran Castle. 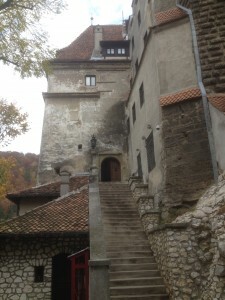 They claim that Dracula never visited this castle when he was alive. This may be true but he definitely visits it now that he is a vampire. The place was crawling with tourists from all over the world, including a lot of Japanese tourists with huge cameras. They were so busy taking pictures they completely ignored our host – Count Dracula. 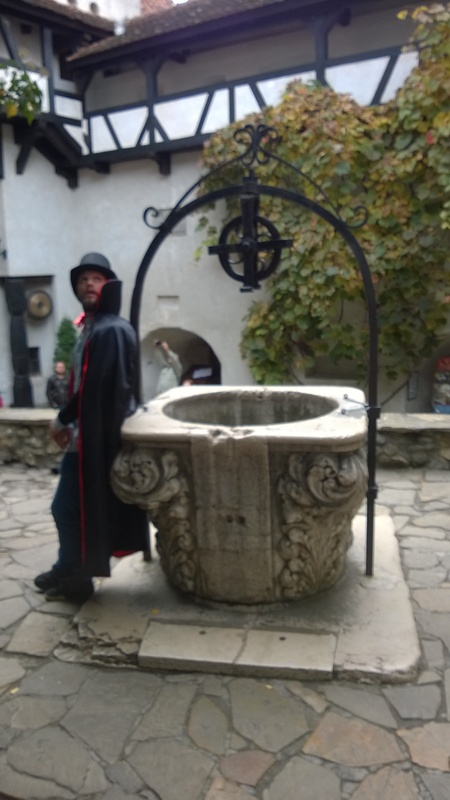 We had only our iPhone to take pictures with because we had foolishly forgotten to take anything else so we kept bumping into Dracula at every corner – in fact he was posing because he was doing a promo-shoot for some local TV. 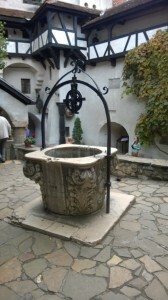 The tour of the castle ends in a courtyard with a medieval well in the middle. I tried to take a picture of this well when I was alone (humans are suspicious of dogs who use cameras). In spite of the fact that I though he wasn’t there at that time, when I looked at my photo afterwards there he was again, posing next to the well. The guy is obviously some publicity freak. So, we had a very exciting trip. 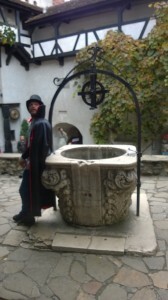 We researched the Dracula business extensively (albeit using nose and iPhone), made friends with many exciting and smelly creatures, got kissed on the noses and admired by the locals, and enjoyed ourselves tremendously. We can therefore recommend Transylvania as a wonderful Corgi getaway. Everything happens much faster in a dog’s life than a human’s. I am three years old and the mother of nine wonderful puppies, six of which are still living with us. 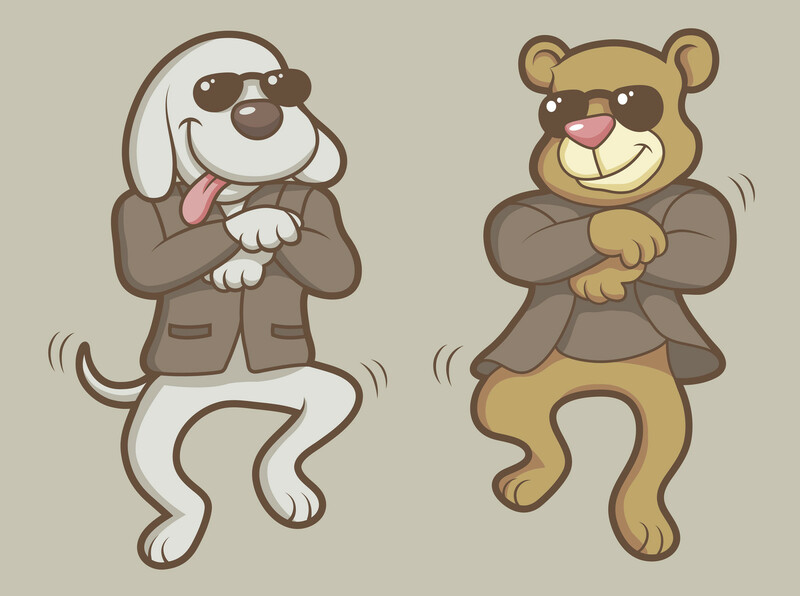 Older dogs like older humans lose touch with the latest fashions. I like a nice atmospheric photograph that took someone time and energy to compose and get just right. The photographer should have to do some work to get the perfect picture. The puppies on the other hand like selfies. Like may be too weak a word. They love selfies! The idea that they can take a picture of themselves, share with everybody, talk about how good they look and then forgot they ever took the picture is something which really appeals to them. 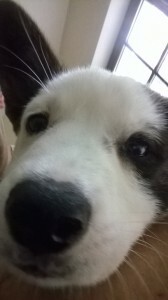 Some puppies are not aware how easy it is to take a selfie so my kids have suggested I write about it in my blog. The first thing to know about is the equipment. You need one of those smart phones which allows you to photograph yourself while at the same time look at what you are photographing. It is also extremely important to have a touch screen. Next the puppy needs to get themselves positioned. A human is really useful for this. The puppy can sit on their lap as they position the phone. If the puppy is bored they can even give their minder a friendly nip. 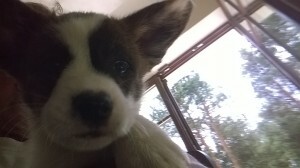 It is also possible to take pictures with the phone on the ground and the puppy looking down at it. 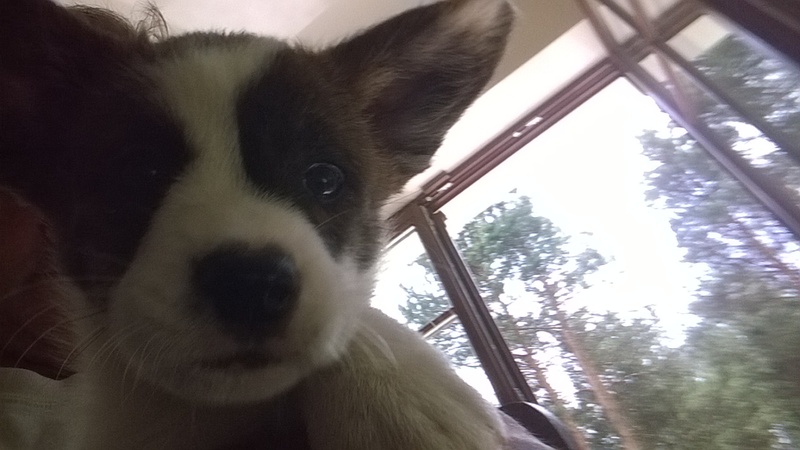 By now you are wondering how exactly a puppy can take a selfie. Well wonder no more. 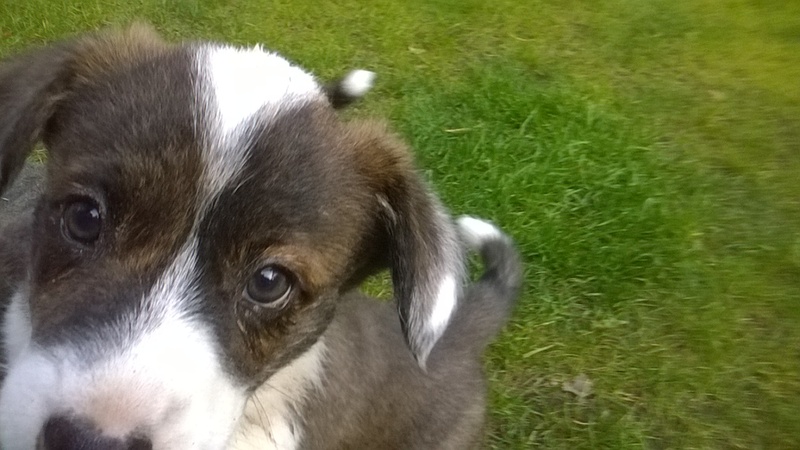 When the puppy is ready for the photo they simply hit the screen with their nose and hey presto! A selfie! I hope you enjoy the selfies which my kids have done and illustrate this page. When they turned up first they moved about with great difficulty and looked very fragile. One of my people used to help me make sure I was feeding them all. It was hard work looking after these little puppies. They seemed to just sleep and feed, or feed and sleep, all the time. Of course they did not neglect their toilet, but even then I had to encourage them. They knew the smell of the other pups and of me and that was their world. Then they grew a bit. They got more hair. They seemed to move more and still they fed and slept, slept and fed. When we all visited the Vet after two weeks he wanted me to start weaning the puppies. He suggested getting them some very nice steak and mincing it so it became puppy friendly food. Bonnie and I were perfectly willing to help them eat this but they seemed to get the hang of it immediately and started getting very fond of this food. It is now five weeks since they were born they have started getting bigger bellies and doing lots more than sleep and feed. They sleep, they feed, they have a big play fight, they poop in the strangest of places. They usually like to show me, Bonnie or one of the people the poop and ask us to admire it. The people are not so good at showing their admiration here. They are getting bigger, they roll around, they play, they explore and they sleep and feed. I had been visiting this nice vet for a month or so now. He had taken a blood test when I first visited him and found my progesterone levels were low. This would have resulted in my puppies dying so I had to get injections every three days. He also used a special camera which looked inside of me. He had examined this carefully and said he thought there were five puppies. Another vet had also looked and reckoned there were four. Anyway I got on very well with this vet. He always gave Bonnie and I some treats during our visit. On this particular occasion my people handed me off to the vet. I thought he was taking me to get some extra treats which he wanted to give me and not also to Bonnie. I could see the sense in this. Anyway, I fell asleep. I woke up and I was lying on a table feeling very groggy. My people and Bonnie were there and so were three or four tiny puppies. I fell asleep again. This time when I woke up there six tiny puppies trying to feed on me. More sleep. I wake up. More puppies. 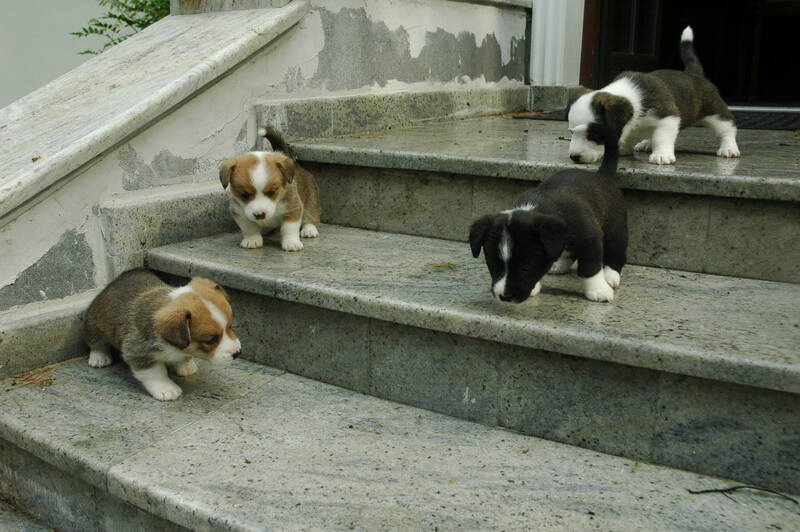 By the time I was awake enough to walk a bit there were nine little puppies and apparently they were all mine. 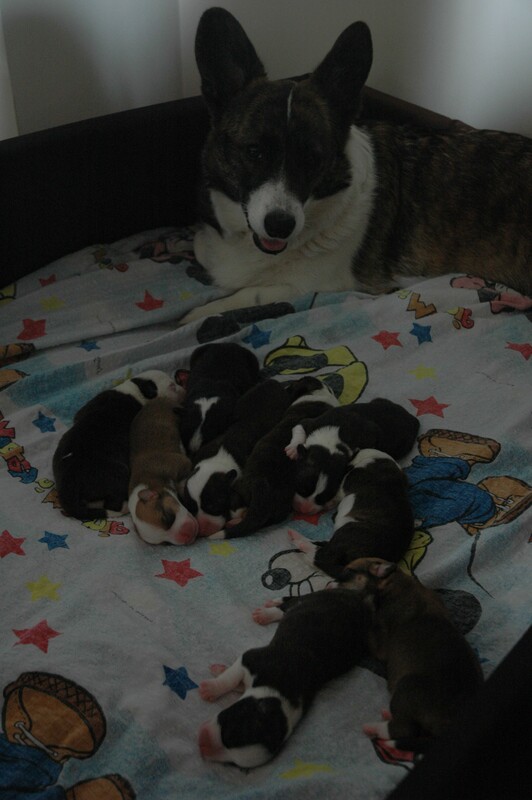 It was a bit of a shock to discover I now had a family of nine pups to look after. At the beginning I was not sure what to do. My people would get me to sit in the box with the puppies. 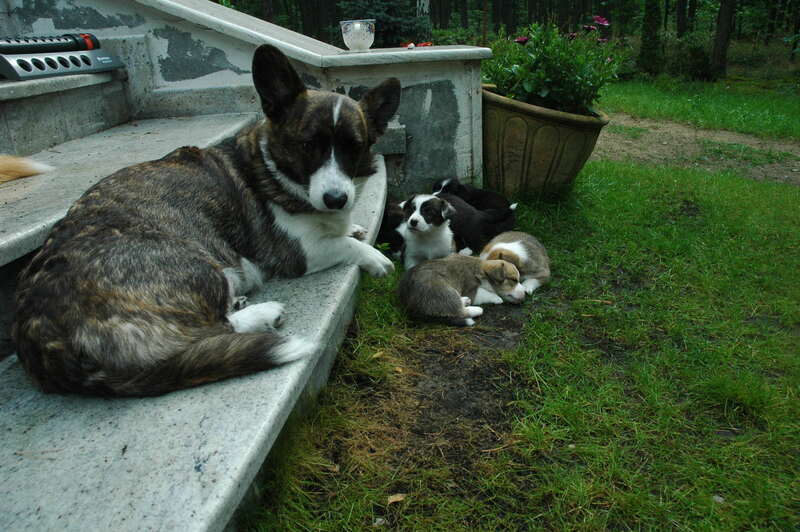 They would then get the puppies to try and feed from me. 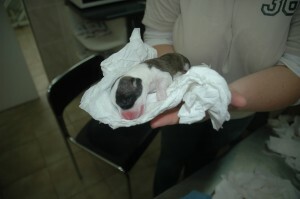 They also used warm wet cotton wool which was brushed against the puppies to help them to pee. The puppies had a lot of things which they had to learn how to do. However, as soon as I fully woke up from the Caesarean section operation I got the hang of it. For the last two week I have been feeding and washing almost the time. Obviously I eat my own meals and these have become frequent. This is good as I have become hungrier. I sleep with my puppies and sometimes I snooze when they are feeding. I have also got some back-up from my people. They help clean our box and one of them always sleeps near it in case of any problems. Everything is going well. The puppies seem very happy with the world and I am very happy with them. In future posts I will introduce you to the individual pups.